Speaking in the House of Commons today, Peter Hain gave his valedictory speech, his last act as a Member of Parliament. The veteran politician and campaigner reflected on almost a quarter of a century in Westminster politics, paying tribute to his friends and family for the love and support which sustained him as an MP. Joining in with other retiring Labour former cabinet members such as Gordon Brown & Jack Straw, the valedictory speeches followed an unusual and emotional day in the Commons. Mr Peter Hain (Neath) (Lab): Mr Speaker, having served for 24 years, may I commend your role as in my view the greatest reforming Speaker in memory, by making the Commons immensely more user and citizen-friendly, and especially for the way in which you have enhanced Back-Bench influence? I thank all the Commons staff, including our excellent Serjeant at Arms and especially the Doorkeepers, with whom I have had a specially close relationship since I invited them in to share a few bottles of wine—South African wine—in the Leader of the Commons’ office. I thank my constituents in Neath and Neath constituency Labour party for their tremendous loyalty and support. I was a Pretoria boy, but I am proud to have become a Neath man. When I first arrived I was shown into a local primary school, Godre’r Graig school in the Swansea valley: “This is a very important person to meet you, class.” A little boy in the front row put up his hand and asked, “Do you play rugby for Neath?” Clearly, he had his priorities right. I have been privileged and fortunate to have the very best friend anybody could have in Howard Davies of Seven Sisters, what he calls God’s own country, in the Dulais valley in Neath. I first met him in February 1990, a former miner who was lodge secretary at Blaenant colliery during the heart-rending year-long strike in 1984-85. My first agent and office manager, Howard has always been completely loyal and supportive, but privately frank and direct—priceless virtues which I commend to anyone in national politics. Having come from a world of radical protest and activism, I never expected to be a Minister for 12 years. It began when Alastair Campbell unexpectedly called and said, “Tony wants to make an honest man of you.” Some former comrades on the left were disparaging, but my response was, “I’ve never been an all-or-nothing person. I’m an all-or-something person.” I am proud of many of the achievements of our last Labour Government, some of which I helped a little with, including bringing peace to Northern Ireland and devolution to Wales. However, there was a tabloid columnist who described me as the “second most boring member of the Cabinet”. My right hon. Friend the Member for Edinburgh South West (Mr Darling), the former Chancellor, came top. At least that was more civil than the editor of Sunday Express at the height of the anti-apartheid struggle, when I led campaigns to disrupt whites-only South African rugby and cricket tours. He said: “It would be a mercy for humanity if this unpleasant little creep were to fall into a sewage tank. Up to his ankles. Head first.” That was nothing compared with the letter bomb I received, fortunately with a technical fault in it, or being put on trial for conspiracy at the Old Bailey for disrupting South African sports tours, or being charged with a bank theft that I knew nothing about, which was later discovered to have been set up by South African agents. Despite serving as an MP and Cabinet Minister, and remaining a Privy Councillor, I have not changed my belief that progressive change comes only through a combination of extra-parliamentary and parliamentary action. We know that from the struggles of the Chartists, the suffragettes, the early trade unionists, anti-apartheid protesters, the Anti-Nazi League and Unite Against Fascism activists confronting groups such as the National Front and the British National party, and Greenpeace activists inspiring fights against climate change. If I am asked for advice by young people, who often ask me, “Can you tell me how to have a career in politics?” I say, “It’s not about a career; it’s about a mission.” We should never be in it for ourselves, but for our values. For me, these are equality, social justice, equal opportunities, liberty and democracy in a society based on mutual care and mutual support, not the selfishness and greed now so sadly disfiguring Britain. These values underpinned the anti-apartheid struggle and brought me into the Labour party nearly 40 years ago, but nothing I was able to achieve as an MP or a Minister was possible without the support of my family—my wife Elizabeth Haywood, a rock to me, my wonderful sister Sally, her daughter Connie, my sons Sam and Jake, and their mum, my former wife Pat. After 50 years in politics some might say it is time to put my feet up, but I have been lucky to have the best father in the world, and he told me in the mid-1960s when I was a teenager living in apartheid South Africa, “If political change was easy, it would have happened a long time ago. Stick there for the long haul.” That is exactly what I will continue to do after leaving this House. Mr Speaker: I thank the right hon. Gentleman. 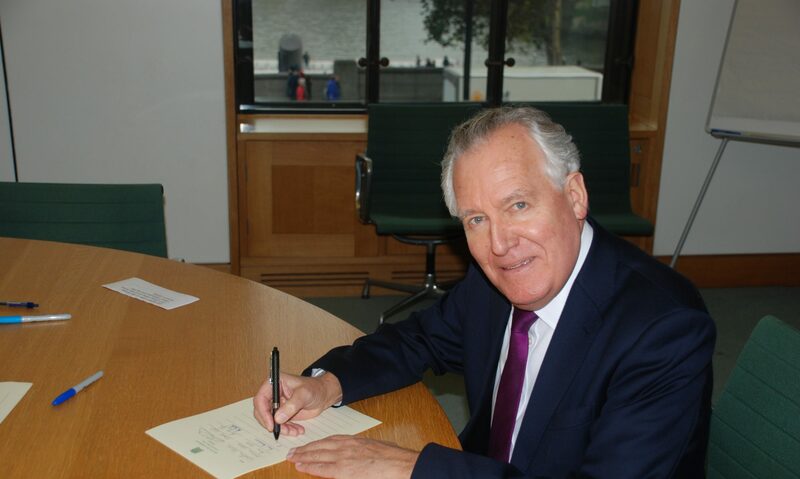 Mr Peter Hain (Neath) (Lab): I endorse the Prime Minister’s welcome to our excellent new chief Clerk. I also welcome the fact, Mr Speaker, that you are proceeding speedily to the appointment of the post that will carry out the chief executive duties, the director general. That is very important. On Greece, may I suggest to the Prime Minister that simply repeating the same dose of austerity on the Greek people and their Government will not achieve the objective any more than the last dose did? National debt went up in Greece as a result of the austerity programme. Of course, the Greek Government have to reform to collect their taxes and to get rid of corruption, and the Government have volunteered to do that, but going down the same austerity road is not going to revive the Greek economy or enable it to repay its debts. Those must be rescheduled and the reforms around that must ensure that Greece is capable of repaying its debts, not being strangled with austerity. The Prime Minister: I do not entirely disagree with the right hon. Gentleman. The problem is, though, that the people who have lent the money to Greece want their money back, and they believe that Greece should carry out a series of reforms before they give it any more money. He or I can take a different view and argue as I would, although he would not, that Greece should never have joined the eurozone in the first place. That is not the right hon. Gentleman’s view because he is a fanatic about the eurozone. None the less, as we have not lent money to Greece, we are not in that position. If he had been at the European Council he would have heard, whether from the Germans, the Dutch and the Scandinavian countries, or from the Spanish, the Portuguese and the Irish, who have all been through these painful processes, that there is very little appetite to cut Greece a lot of slack. How can Labour prove it’s not on the side of a small cabal in the Square Mile? How the recent tax avoidance scandal shows that the softly softly approach won’t work, and we need a financial transaction tax. Closing the stamp duty loopholes could raise us £2bn a year in extra revenue – this offers a real chance for Labour to put itself on the side of the majority of the electorate and not on the side of a small cabal in the Square Mile. But the real prize comes in extending the stamp duty to a fully-fledged FTT that covers derivatives and other financial asset classes, as they are doing on the European mainland. Labour shouldn’t get bogged down in old arguments about waiting for the United States to join the proposal – not now it’s happening on our doorstep. We should act. Anti-austerity champion Peter Hain has launched a stinging attack on Chancellor George Osborne as figures reveal Britain is struggling through the slowest economic recovery on record. Data compiled by the Trade Union Congress shows that the British economy has typically grown in size by 16.1% in the first five years after recession – however under George Osborne that number has struggled to reach 8.8%. This news compounds the Tories economic woes as in January it was revealed that over one quarter of Wales’ working age population is economically inactive. In the last quarter of 2014 Britain’s economy grew by just half of a percentage point, much lower than estimates from the Office of Budget Responsibility and City of London had expected, while Britain’s growth prospects for 2015 have also been revised down to just 2.4% in total, after the OBR had initially confidently predicted growth of 3%. Fears are growing of another recession in Britain as economic indicators are suggesting a general slowdown. Employment in Wales fell by 40,000 over the year from January 2014. “A vote for a Tory is a vote for economic lunacy in the upcoming election”, said Mr Hain, as he urged Welsh voters to defy the neo-liberal orthodoxy that drastic cuts would balance the British economy. A graph by the TUC details the average growth of the British economy in the five years after a recession.